Begun as a committee to help newly arriving immigrants in 1956, the Trenton Donauschwaben quickly evolved into a social and cultural institution. Indeed the very first Trachtenfest was held in January of 1957. By the end of that year, the club became a member of the Dachverband der Donauschwaben. Since then, it has served as both a gathering place for friends, family und "Landsleute" as well as an organization that seeks to promote and preserve our cherished heritage. In the early years, we conducted our meetings and events in a variety of places ranging from a church hall in the city of Trenton to a member’s farm many miles away. 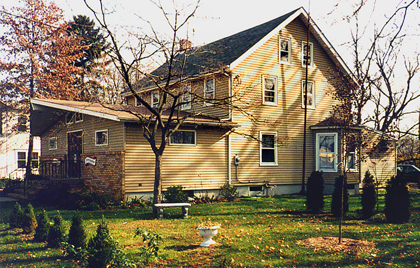 In 1973 our members self-financed the purchase, renovation and expansion of a 100+ year old farmhouse that came with a ¾ acre sized picnic area and a caretaker’s house. Though modest in size, the facilities have served our needs very well over the years - though we always seem to be remodeling or improving something! Yet, while our "Vereinsheim" traces to a bygone era, our efforts to communicate with our membership and friends do not. In 1999 our club joined the high tech age and began its popular and full-featured web site, www.trentondonauschwaben.com. Tens of thousands of web-visitors have checked us out to date and the number keeps growing. An equally important communication tool is our quarterly newsletter "The Trentoner Donauschwaben Nachrichten." Begun in 2001, the publication contains genealogical and historical articles, automotive news, editorials, and the latest goings-on at the club. Also featured are fascinating stories written by the older generation about the time "back home." We could not be happier with the success of this undertaking. Speaking of "back home," our club is committed to honoring the memory of those who died during and after World War II. 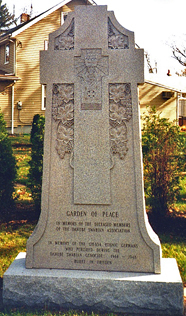 For this purpose we maintain two memorials. 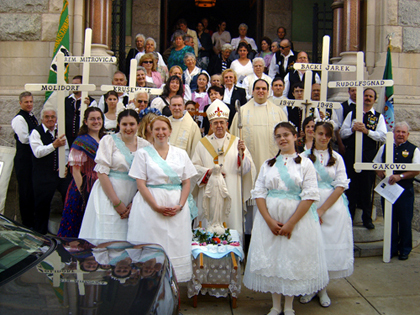 The largest of these is located at Our Lady of Lourdes Cemetery in Trenton where we have held annual prayer services since 1979. The 18 feet long by 6 feet tall monument is one of the largest of its kind and remains a powerful reminder of what our people had to endure. As important as it is to remember our past, clearly our club’s survival depends on what we have done and are doing for our future. Like our friends at the Philadelphia Donauschwaben and the United German Hungarians, our club can be proud of its strong commitment to the younger generations. We formed our first Kindergruppe in September, 1957, which gave way to a German School for children shortly thereafter. Throughout the 1960’s and 1970’s, up to 60 students were enrolled in 5 grades covering everything from der, die, das to the works of Nicholas Lenau and Adam Mueller-Guttenbrunn. Currently, our German School meets each Friday evening and all elementary and middle school youngsters are invited to attend. Besides the school, our dance group has been an important element in keeping our youth involved at the club. Our Jugend Tanzgruppe was enormously successful throughout the 1970s and 1980s with up to 12 couples performing in places like Milwaukee, Washington, D.C. and the Catskill Mountains of New York. 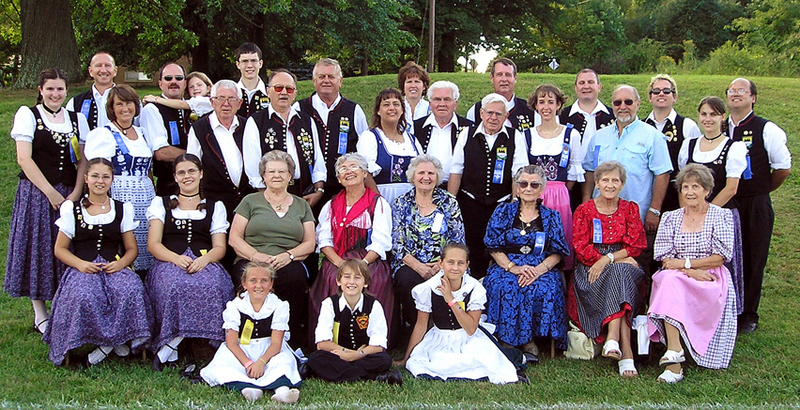 In the last several years, our dance group combined with that of the Philadelphia Donauschwaben in a joint venture that has been a big plus for both clubs. In addition, frequent canoeing, camping, hiking and skiing trips have been and remain an exciting part of the club’s schedule of events geared toward the young (and the young at heart!). Some of our activities are directed specifically at our older members. Since 1980, our club has had an adult German language program. Many active members have come from the ranks of the adult student population and the school remains vital to our club’s mission. The semester runs from April through October and anyone interested in attending can contact the club for more information. More recently, we started an "AutoKlub" for the car aficionados among us. Since its inception in 2003, the group has grown steadily in size and many of its members play an active role in the club. Since 2005 we have joined with our neighbors at the German American Society to host a successful car show that attracts well over one hundred cars and many hundreds of spectators. In 2007 our club joined the Donauschwaben Villages Helping Hands web site (www.dvhh.org) in order to help the organization promote our Donauschwaben history and genealogy. We are grateful to the many dedicated and hard working members who have made it possible for the Trenton Donauschwaben to enjoy so much success over the years. Thanks to them, our club is doing well and looking to the future with optimism. Because of them, we remain committed to being a meeting place for all to enjoy… and a place where the spirit of our ancestors lives on. Prosit liebe Landsleute und Freunde! Villages: Palanka, Neudorf, Tscheb, Bukin, Siroko Polje, Starcevo, Plavna, Gajdobra, Hodschag, Filipowa, Parabutsh, Obrowatz, Weprowatz, Kernei, etc. Family Surnames: Bauer, Bohn, Brandecker, Franz, Hepp, Herdt, Helleis, Huhn, Jakober, Kernast, Lieblang, Maas, Mayer, Martini, Metternek, Pfann, Rohrbacher, Schmidt, Walter, etc.